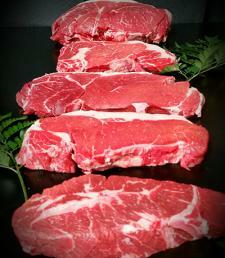 From rib-eyes to hamburger, pork ribs to chops and loins, you'll find it all at a great price in our meat department. We have a wide selection of poultry in our 20 foot fresh frozen meat case. All our poultry arrives frozen and is never thawed to ensure the best quality. We also offer a full line of fresh frozen seafood that includes fish sticks, shrimp, scallops, sushi, crab, and much more! In our deli you'll find sliced meats, cheeses, and salads for every occasion. Boneless whole and half hams purchased at our store can be sliced free of charge! We offer many local favorites including Blue Bird Locker, Dimock Cheese, and Dakota Tom's sandwiches. Ask about our custom made meat and cheese trays for your next get together.